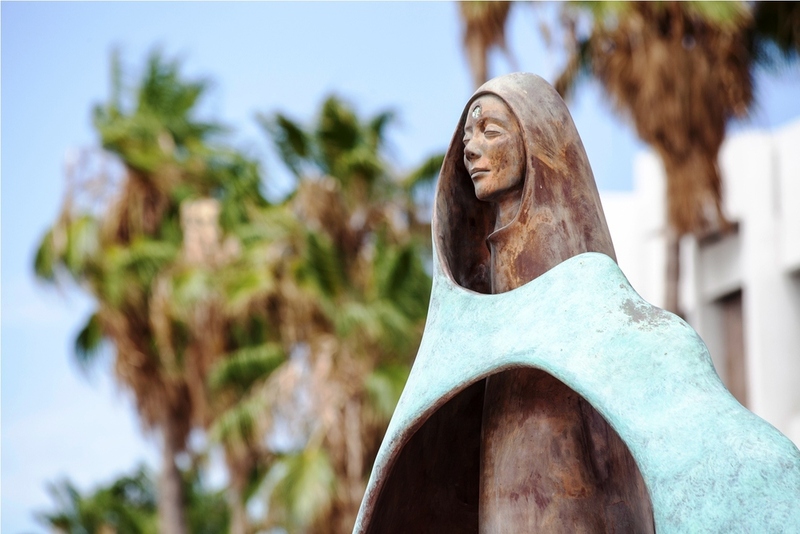 The sculptures donated by Tenaja Holdings and its founder contribute to the cultural and aesthetic beauty of the Mexican communities of La Paz and El Triunfo. These works of art – Viejo del Mar, Reina de los Mares, Coro en Armonía, Caracoles Músicos, Sofía y Juan Matute, and Poetas para la Tierra – grace the Baja California Sur neighborhoods and historic centers where they are located. Several of these sculptures were donated through the International Community Foundation. Tenaja Holdings believes that art revitalizes urban areas by generating commerce, fostering creativity and nurturing community values. We aspire not only to preserve our heritage but also to inspire innovation. Inaugurated on May 14th, 2004, this work by Guillermo Gómez Macías is a widely admired feature of the popular Malecón, the waterfront walkway in downtown La Paz. 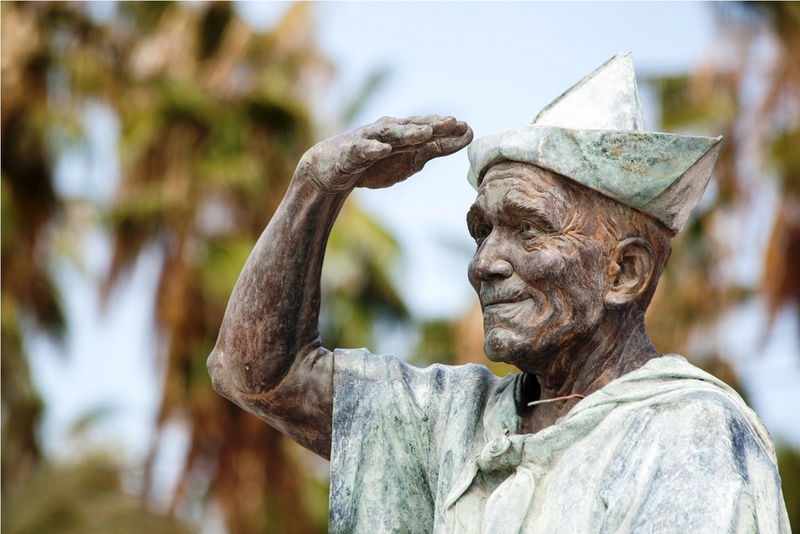 Although the name of this sculpture may be reminiscent of Ernest Hemingway's The Old Man and the Sea, this bronze fisherman who gazes out to the Sea of Cortez alludes to a different tale. Read the charming story behind El Viejo del Mar written by the artist himself. where I wrote my dreams. It has no anchors no moorings. where I know, I will run aground in the coveted Harbor. …has anyone seen the shining light from its lighthouse? Artist Rocío Sánchez created this alluring bronze seashell that also adorns the Malecón of La Paz. Unveiled on December 2, 2002, this 500-kilogram sculpture was created using the process of lost-wax casting and finished with a two-tone acid patina and an olive-green peridot gemstone (olivine). From the street side of the sculpture, only a shell that has been eroded by the sea is visible. Walking around the work of art, one discovers the serene Queen of the Seas that lives inside. Discover more fascinating details about this piece from Rocí0 Sánchez herself. and within her hands, the fish that will live. that miracles will echo when life is born. from whose innermost parts we spring. Our roots are linked to you. We are your dreams, your hopes. The park poem Stones and Birds was written by Christy Walton and translated into Spanish by writer Uriel Santana. Both versions are displayed on the park walls and integrate the fountain and the park into a single, pleasing whole. Guillermo Gómez Macías also created Los Caracoles Músicos, a set of three cast bronze sculptures, each representing a seashell musician, each indigenous to a different country, and each playing a different musical instrument. This work of art is located directly opposite the main waterfront pier, on I. Bañuelos, one of the pedestrian streets in downtown La Paz. In explaining this piece, the artist refers to the game of holding a seashell to one's ear to hear "the sound of the ocean". He points out that seashells are found worldwide and that their forms and colors are as diverse as the villages on earth. Even so, when "listening to shells", their sounds are identical; they all seem to sing a universal song that triggers feelings and memories of our own experiences with the ocean. Likewise, music around the world is as diverse as the people who create it, yet despite the variety of languages and cultures, music has common themes relating to the universal experience of living. In this way, the sculptor suggests that both seashells and music remind us of our shared identity as human beings. Preserved in bronze, mining engineer Juan Matute and his mule Sofía add a distinctive focal point to a central courtyard of the little village of El Triunfo, south of La Paz. Unveiled on April 18, 2015 at the opening of the Bar El Minero restaurant, these lifelike, inspired works were created by sculptor Guillermo Gómez Macías. In April 1889, Engineer Juan José Matute Cañedo was hired by the Cacachilas District Gold and Silver Mining Co. to survey the road connecting La Paz to what was then the mining town of Cacachilas. He also conducted a topographic survey of the lands from Cacachilas to La Ventana Bay. Sofía represents amicable relationships between humans and animals, and the support that animals have given humans to achieve their goals. Visitors are encouraged to don a hat, climb into the saddle, and imagine what it was like for Juan and Sofía to carry out their work together, starting from La Paz Bay, climbing up through the hills to El Ancon, past Rancho Chivato and Las Canoas, through the Cacachilas mountain range, to finally reach the mining settlement at El Tesoro. Visit the Bar El Minero website to learn about this restaurant designed by Tenaja Holdings, and to see more photographs of Juan and Sofía. Poets of the Earth, created by Benito Ortega Vargas, is located on the Marea campus in the historical fishing community of El Manglito in La Paz. Below is an English translation of the artist's poem that describes his work of art. her body is like a transport to bring this world peace, hope and poetry. With her hand on her heart, she feels the beat of the universe. Carrying a light as a guide. Her singing opens a path through the mist. as a witness, a friend, and a helper.